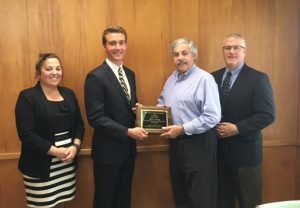 Elliot Knapp has been named the 2017 Outstanding Senior of the Year by the Lebanon County Bar Association and WLBR/WQIC. The 2017 Cedar Crest High School graduate plans to attend the Honors College at Purdue University to work toward his career goal of becoming a pilot flying for a commercial airline or work for a major airline corporation. From nominees offered by each of the county’s school districts, this award seeks to recognize one outstanding senior for his or her accomplishments both in and out of the classroom. Each county school district nominates one senior and the committee’s job is never easy since all of the nominees are typically outstanding. Nevertheless, there can only be one award recipient and the committee seeks to honor the senior which it believes stands out among the best and brightest. PHOTO: Presenting the award to Elliot Knapp (second from left) are, from left, Heather Eggert, Esq., President and General Manager of WLBR/WQIC Robert Etter, and Marc Hess, Esq.